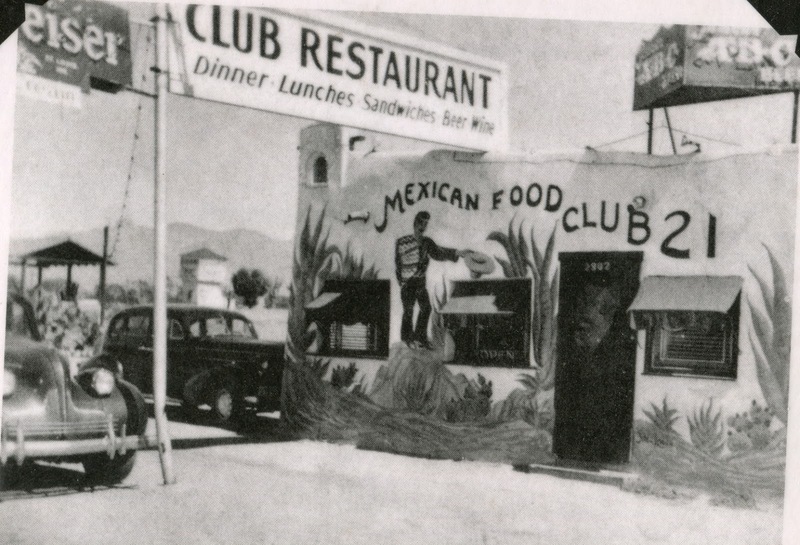 The Club 21 menu proudly displays the earliest known photo of the historic restaurant at 2920 N. Oracle Rd. Tucson's Club 21 is the sole survivor of once common Family-owned restaurants alongside US 89 through the Old Pueblo. While all the original roadside diners and small restaurants that once lined US 89's famous Miracle Mile along the Stone-Drachman-Oracle Corridor are gone, Club 21 remains in the Founding Family's hands and lives on stronger than ever. Club 21 joined the scene on the north end of the once glittering neon Miracle Mile in 1946. Brothers George and Abe Jacob borrowed some money from their mother and rented a tourist cabin what was then north of town. The cabin had been turned into a hamburger stand. "It had about six or seven stools and three booths," says John Jacob. Club 21's founders, Abe & George Jacob in Sept. 1950. George, who had been a cook in the Navy, assumed kitchen duties. "He was too young to serve beer and wine," says John. At first, Mexican food was not on the menu, says John. "I think my mother suggested it," he says. Then they took on a cook their Uncle Joe recommended who could cook Mexican food, John adds. 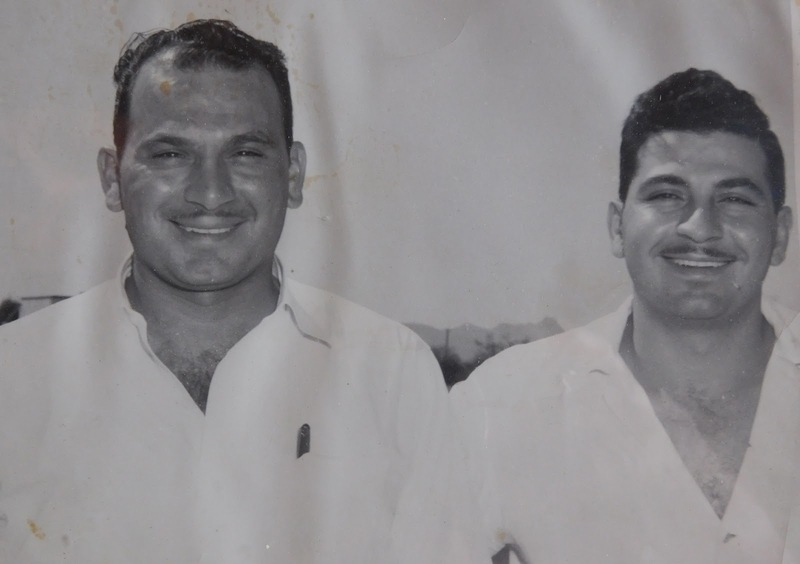 Over time, the brothers bought the property and the restaurant expanded, especially after a full liquor license was granted. "We kept the original building and built all around it," says John, adding that in the beginning, "we were only taking $25 a week apiece for ourselves." "While several competing stories exist about how the restaurant got its name, the one current owner, Taft "Skip" L. Jacob, likes to tell is that his dad, George Jacob, and uncles salvaged parts of old signs — one reading "Club," and the other "21" — to come up with a name for their fledgling cafe." US 89's Glory Days that remains in the hands of The Founding Family. 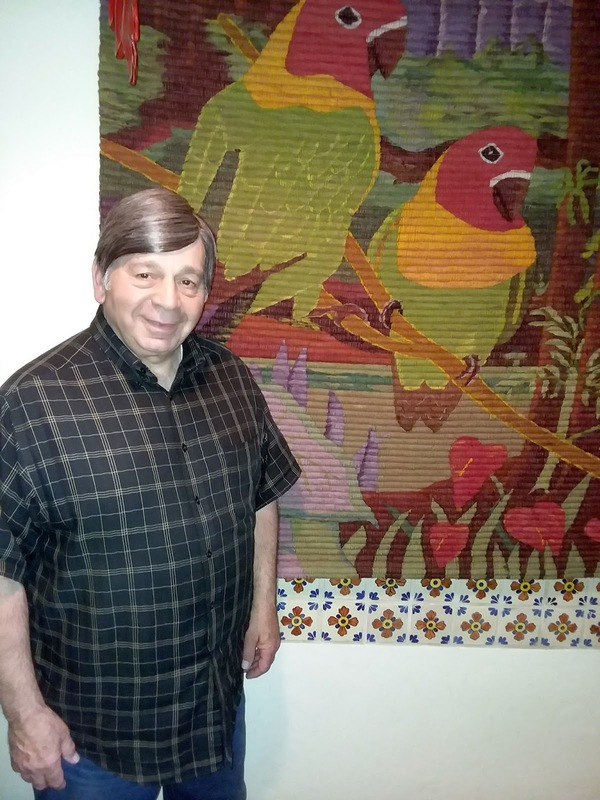 The US 89 Team was honored and delighted the morning of March 21, 2018, to spend an hour chatting with Skip Jacob. Skip is a wonderful story teller and regaled us with Family Tales and some wonderful personal anecdotes. Skip was born in 1947 and might has started working "part time" in Club 21 when he was 5 years old. 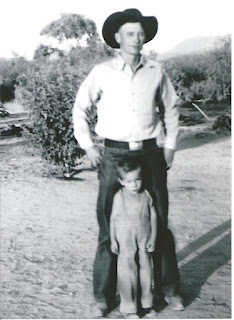 He was for sure working regularly at the eatery by 1955 when he was 8. Skip's Family Pride in Club 21 clearly glows through all of his words and recollections. We returned later at lunch time and enjoyed a superb lunch. We highly recommend Club 21. Club 21 opened its doors just as US 89 was on the doorsteps of ever-increasing post World War II traffic. 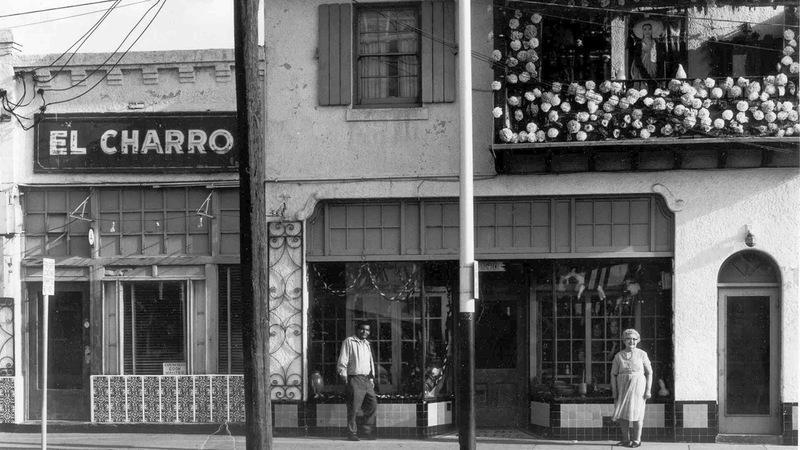 The restaurant's great location at the north roundabout on Miracle Mile helped it reap a steady flow of local and traveling customers until I-10 eventually siphoned off Miracle Mile's heavy traffic. However, Club 21's menu and reputation was by then well known far and wide. The restaurant not only continued to survive but thrived. Many reviewers talk about visiting Club 21 for years, some even back into the 50's and 60's. 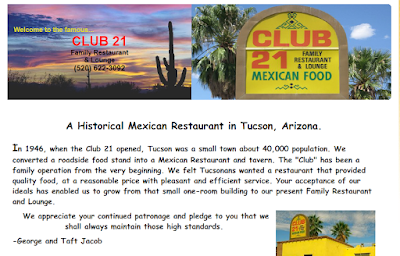 Some reviewers call Club 21's Mexican food the "best in Tucson". Roughly four out of five reviewers rate Club 21 Very Good or Excellent. 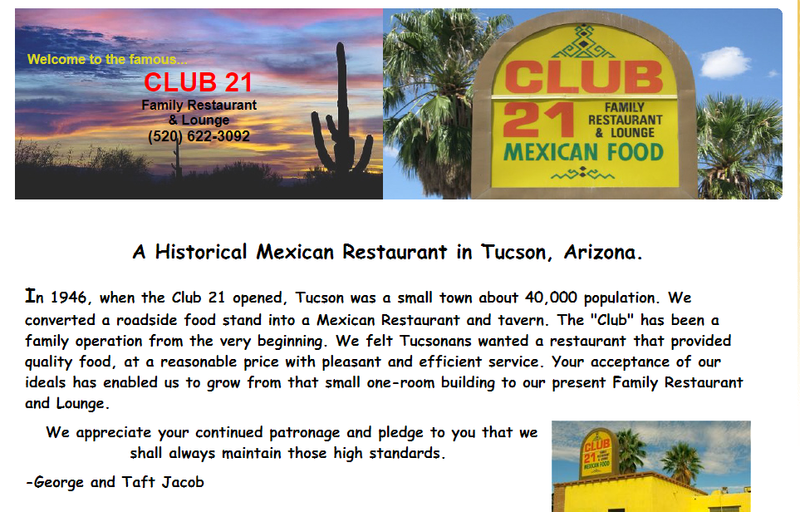 Club 21 is a "must visit" for any US 89 Heritage Tourists passing through Tucson! Budweiser Clydesdale's pulling the old beer wagon on Miracle Mile. Judging from what appears to be a late-1940's Buick in the background. been a very popular place for the Budweiser Clydesdale's to visit! 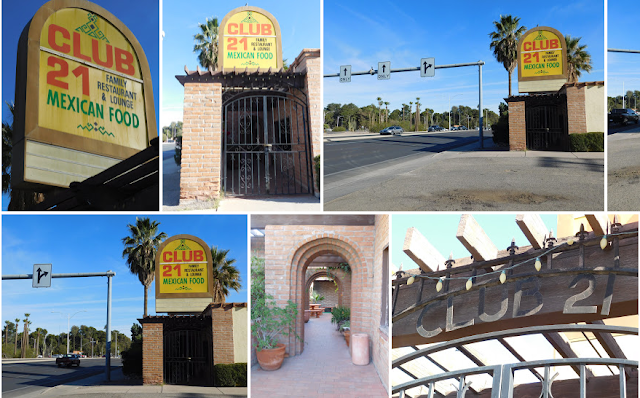 We wish to thank Jill from the Tucson and Pima Co. History Facebook group for helping us find Club 21. 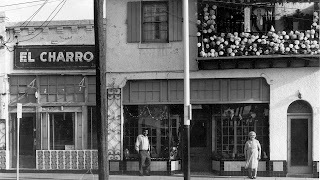 We had searched "high and low" without luck for any remaining ancestral Family-owned restaurants from US 89's early Tucson days. We even created a post that said there were no such restaurants remaining. Luckily, Jill came to the rescue and told us about Club 21. Thank You, Jill! 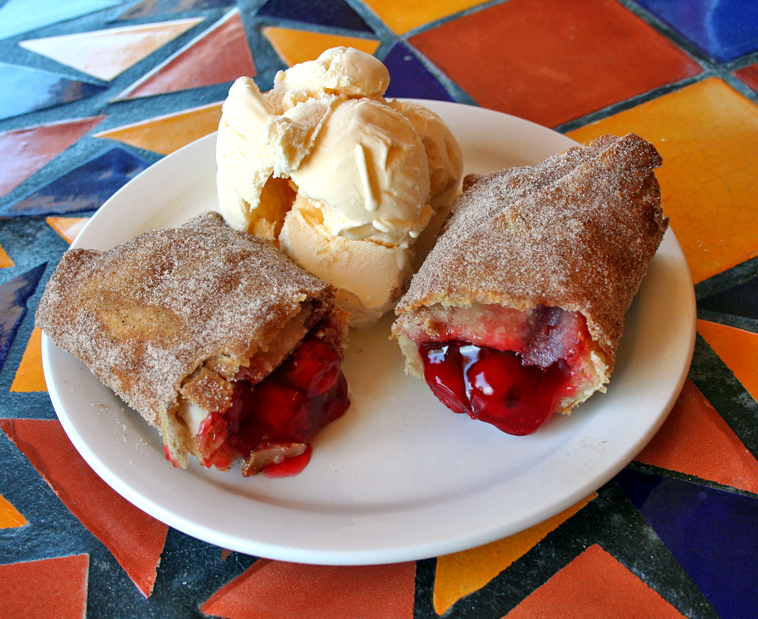 Prescott's Hassayampa Inn isn't your ordinary deep-fried roadside restaurant . It is a splendid, first-class, top-shelf dining experience in one of Arizona's premier hotels. The Hassyampa owes its very existence to one of the first crowd-funding projects in America. Back in the 20's, local folks were asked to buy "shares" and, voila, this is what they got as a reward. 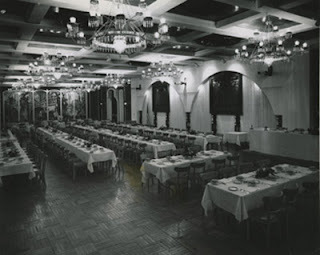 The Hassayama opened to great fanfare in 1927, just a year after US 89 came into existence. 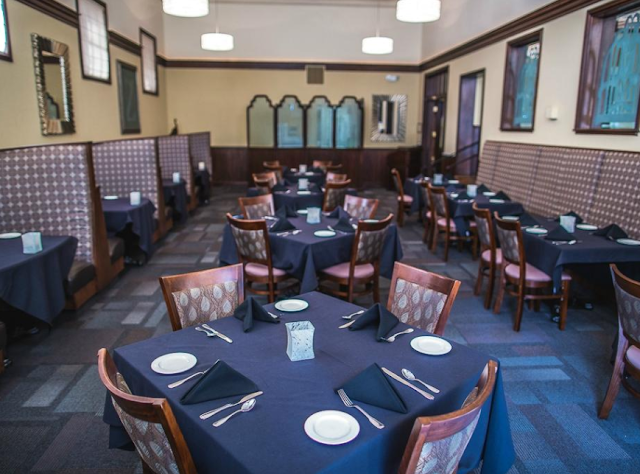 Today, the Hassyampa can easily lay claim to being the highest class elegant restaurant located right alongside curbside of old US 89 in historic downtown Prescott, Arizona. Yellowstone's Old Faithful Inn and Mammoth Hotel dining rooms are the Hassyama only rivals between Mexico and Canada! "Among Prescott hotels, the story of the Hassayampa Inn is truly unique. Even before it was constructed, the Inn helped to bring the people of Prescott together. During the “roaring twenties,” El Paso architect Henry Trost was challenged by a group of residents to design a grand hotel – a place where people could relax, chat and escape the grind of their hectic lives. Hundreds of Prescott citizens bought shares into the project at $1 each and the result was the construction of a stunning red brick building, completed in 1927, that would serve as the cornerstone of downtown. 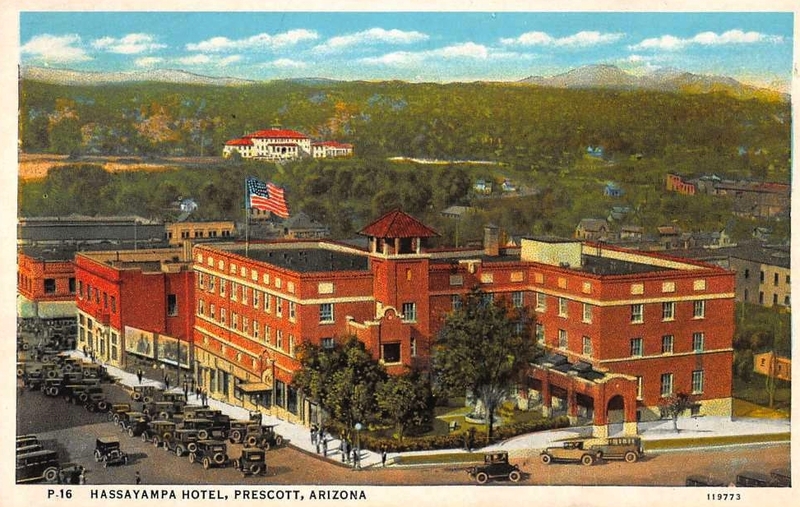 Back then, it was known as the Hassayampa Hotel. 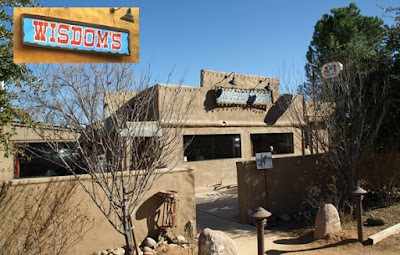 These warm and welcoming accommodations were named after the Hassayampa River located north of Prescott, which mysteriously sinks beneath the surface for much of its 100-mile journey. 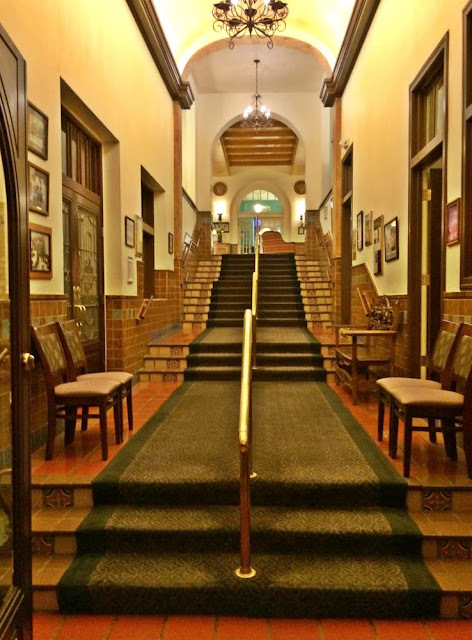 The Apache word “Hassayampa” loosely translates as “the river that loses itself” is a fitting moniker for a hotel that was designed to be a place where patrons can emerge refreshed and relaxed. Today, the Hassayampa Inn remains an anchor in the community. The building is included in the National Register of Historic Places and is a member of the Historic Hotels of America. But most of all, this red-brick hotel is as charming today as it was more than 90 years ago." The Hassayampa is definitely light years removed from the typical roadside highway diner! As one reviewer put it, "I am rating The Peacock Room 5-stars, not because it is the best restaurant I've ever eaten at, but because it is an outstanding example of how a hotel can "get it right" with their on-site dining room. This is a place I would willfully choose again even if I wasn't staying at the Inn." The one and only State Street is US 89 through Salt Lake City. Back in US 89's Glory Days, we have no doubt that State Street was a rhinestone roadway sparkling with beckoning neon glittering in front of motels, diners and sundry attractions. While there might be a few such ancestral overnight accommodations remaining, it appears 100% of the roadside diners have gone to the great deep fat fryer in the sky. Salt Lake City's eldest diner was gentrified 15 years ago when auto and sports mogul Larry Miller bought the 1902 Snappy Service Lunch and plopped it into lobbies of multiplex theaters throughout the region. 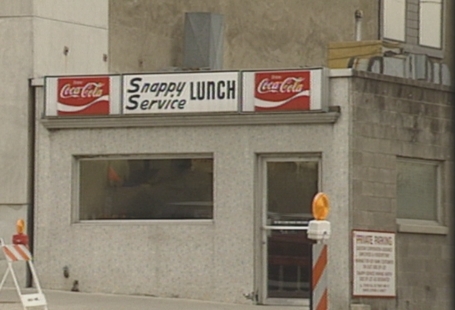 Snappy Service Lunch was best known for its SPAM and egg sandwich. We'd bet it was a very popular dining spot through the pre-fast-food early decades of US 89. We've searched high and low for any remaining old diners along State Street. We've come up empty handed. There are hundreds of places to eat in Salt Lake City so you're certainly not going hungry there. Unless and until we can find a historically accurate, culinary certified roadside diner along State Street, we won't be providing a restaurant review for Salt Lake City's stretch of US 89. Yarnell's Ranch House dates back possibly into the 1940's. 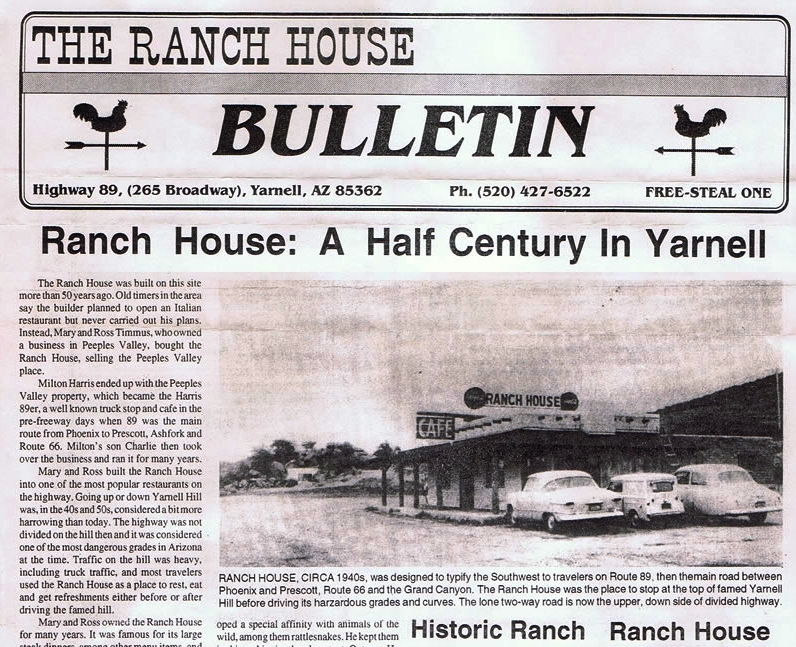 It's difficult to determine the age of the restaurant from available online history. It's only open four days a week from 7 AM to 2 PM so it's strictly a "weekend warrior" breakfast and lunch kind of place. It appears to be extremely popular with the biker crowd so beware, you could be in for a long wait if you happen to show up when a biker group has stopped for a meal. "Mom's Cafe has been on the cover of National Geographic. It's been the subject of various glowing national restaurant reviews, including "One of the Best Places To Eat in the United States" by Eat Your Way Across the USA. Its walls are lined with famous people who have dined there, from Willie Nelson to Tom Brokaw to Ashlee Judd. Its scones, biscuits and chicken-fried steak have been praised far and wide. People will crawl on their hands and knees for Mom's pies." 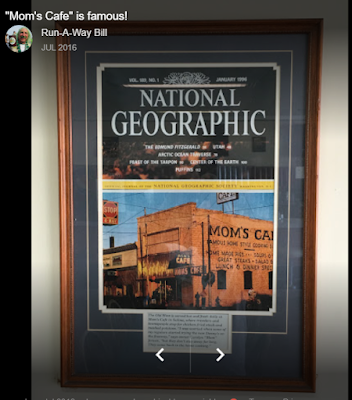 With comments like the above and framed proof as seen below, it's easy to understand how the 1926 Mom's Cafe in Salina can call itself "famous". 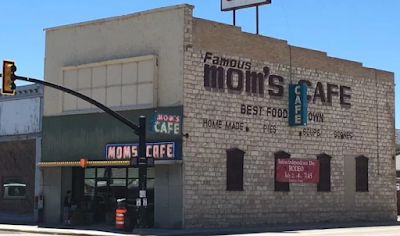 Mom's is one of those all-time classic highway diners that seems frozen in time, turning out biscuits and gravy just like they did 90+ years ago when US 89 was born. 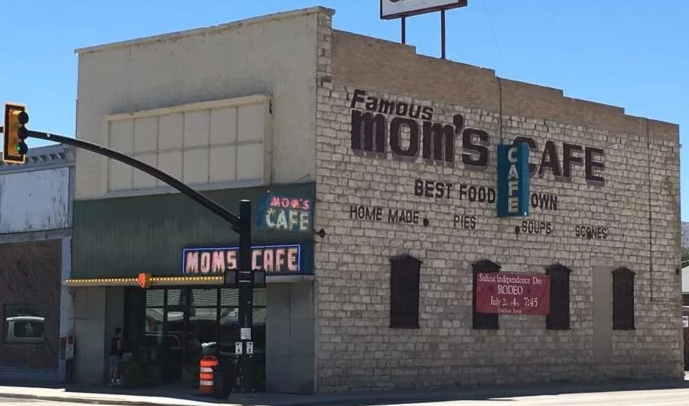 Mom's is arguably a culinary shrine to US 89's Diner Days, sitting as it does on a key 90-degree dog leg on US 89's route through the Beehive State. 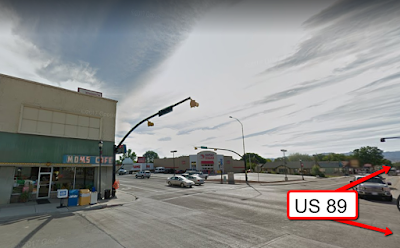 From what we can find online, Mom's has gone through at least a couple of new owners in recent years. Luckily, the Yelp and Trip Advisor reviews suggest the food and service remain as famous as ever. The graphic below shows the location of Mom's at Salina's main intersection. Here are some links to various Mom's stories we found online.